Landon tried as hard as he could to summon a ball of light to let him see who or what was out there, but the spell stubbornly refused to work. Still nothing. No light at all around him, nothing except the cold, dark, and the breathing. He jumped and yelled as something grabbed his right arm. Then two hands on either side, and then more. A dozen claws grasped his body from the shadows. He struggled, screamed, and cried, but they held him in their merciless grip. They relentlessly pulled the second-grader forward toward where the man had spoken, the figures surrounding him hissing like cats or snakes. If only he could make the light spell work. It might surprise and blind them long enough for him to get away. “Please, please, please,” he whispered. Then they all stopped, and whatever had spoken before moved close enough to where Landon could smell his fetid breath. “You are going to be delicious, little boy.” Strong fingers with long nails ran through his hair and with a shriek of terror, the child’s spell burst into brilliant life just long enough to reveal blood-red eyes and two pointed fangs. Landon woke up soaked with sweat and abruptly sat upright in bed. He looked at the window to his right to see the first light of dawn come over the horizon. He was back at the barracks. No, he’d never left. Seventeen-year-old Landon groaned as he adjusted the patch over his blind right eye. He had grown weary of spending long months living in the nameless military compound in a pocket dimension, the one created by the nameless overseer of the Master and his Council of Twelve. Yet, he couldn’t go home, not yet. He had one more grim task to perform, and he had to do it alone. Dressing in a simple tunic and slacks after his shower, he checked himself in the mirror in the bathroom of his quarters on base. His hair was longer than he liked, and somehow, his face looked older, not more mature, but tired. He thought of his friend and master the Dragon. Xen was still in a coma and being tended to by the dragons and children in the exile city of Vovin in another universe. His friend Steve was still alive, thanks to Carmen’s adept surgical skills, but it would take weeks and perhaps months for him to recover. Most of the indentured troops, all of them kidnapped from their own realities, had gone back home, leaving only a small garrison to guard their former masters. Each of the evil ones were encapsulated in suspended animation chambers, that is, until Landon and the others could figure out what to do with such dangerous creatures. The boy now considered himself a guest of his former training ground, and indeed, he had learned a great deal about the various arts of war, or so he guessed. But now the war would be fought by magic and not by swords or guns. Well, that wasn’t quite true. He walked back into the bedroom, and on his spartan writing table was the staff, the one given to him by a fallen comrade. It wasn’t meant to be an occult item, just a walking stick to support him as he recovered from his former wounds. But as he was riding the great mother dragon Shay to rescue the captive Xen from the hideous caricature of his childhood home, he found he could channel his will through it. The staff acted as an amplifier for his own power, though he still didn’t know how. He did know he was going to need all the help he could get. Landon opened the door to find the fort’s primary medical practitioner, Dr. Carmen Ramsey. She wasn’t much older than Landon, long dark hair, tanned complexion, dressed today in a light silk blouse and plaid skirt that went down to her ankles, shadowing her brown calf-skin boots. He thought he caught a whiff of honeysuckle from her. “Sure.” He stood aside, and after she entered, closed the door behind her. He could see her eyes moisten with tears but she refused to cry. Carmen put her hands at her sides and stepped back a few paces. Landon dropped his arms down. “Don’t make promises you can’t keep.” Without saying another word, she walked around him, opened the door and left. The teenage mage sat cross-legged in the middle of his small living room floor, his staff in his lap, and a little something extra tucked into his pants pocket. He had donned his boots as if preparing for a journey, but to a casual observer, though none were present, he seemed to be in a deep meditative trance. In truth, though his body was present, his spirit was elsewhere following the clues that had been left behind for him, possibly deliberately. The first time he was on the outskirts of the tree city of Vovin, he had been with Steve, and they had both been chasing Estaban across both time and dimensions with the aid of a time stone. Estaban had mortally wounded his twin brother, and Landon wouldn’t leave him. But the mother dragon Shay exhaled a stream of ethereal flame at the time traveler just an instant before his portal closed. Landon couldn’t tell if fire had found its target, but he was able to detect the location of the next jump in timespace. Then, in a completely separate pocket universe, one meant to look like the place he’d grown up as a kid, in dispatching the three guardian shadow demons and rescuing the tortured little Buddy, he sensed a momentary whiff of smoke leave that reality for another. These gave him a direction in which to begin his search. In the last ten years, he and the dragon had experienced many adventures, and made both friends and enemies on many worlds. It was the spirits of the former he consulted with now. Most of them knew nothing, and those few who did, urged him to give up his solitary quest, for the rumors of a dark presence of immense age horrified even the stoutest among them. But the visions of the comatose dragon and the still hospitalized Steve drove him on. If he couldn’t find it and stop it in time, the rest would join them, most likely in death, and that would only be the beginning of the evil’s razing of the multiverse, including the human world. It had made him, and hundreds of others, fight in mock but lethal combat for its own amusement. But that was only to pass the time until it could prepare the complex set of spells necessary to rend dread secrets about the origins of the universe from the captive golden dragon. Now that Landon had prevented that and placed his master in a world even the enemy could not easily penetrate, not only was Landon looking for it, but it was looking for Landon. He didn’t have much time, and it was imperative that the boy strike the first blow. “There.” A familiar glimmer in the darkness. A touch of emerald. He felt its mate stir in his pocket and set the thought aside in case it was detected. Landon’s eyes snapped open and he got to his feet, raising the staff in his hand above him. Speaking forbidden words in a long dead language, he glowed with vast energies of red, violet, and green, and then there was a blinding explosion of light. When it faded after a few moments, the room was empty, and in her room in a different part of the compound, Carmen shed a single tear as she felt Landon’s presence vanish from her world. 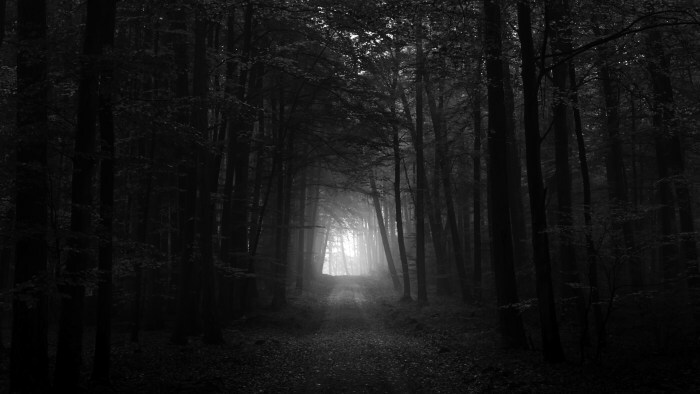 He was in a dark forest at night. A gibbous moon and strange stars overhead giving the only light. He was dressed in the same manner, the staff remaining in his right hand. For a moment, he had been afraid that his prey had managed to change his reality. The teen slowly walked into a clearing, strongly sensing the presence standing in the middle. Moonlight revealed the man in silhouette, but by his aura, there was no mistaking him. It was then that he looked closer at the aura. It was the same, but different, as if part of his metaphysical matrix had been ripped away and crudely replaced by some other material, something with a hint of the grave. During their conversation, Landon had been steadily walking toward the shadowed Estaban. Now they were just a few yards apart, and that’s when the teenager stopped. He firmly placed the end of the staff on the moss-covered dirt, gripped it tightly, and mentally prepared his assault. He didn’t want to kill Estaban, merely drag the secret of his dark overlord from his brain. Suddenly, the temperature dropped to sub-freezing as ice covered the previously verdant wood, and Estaban stepped into the light revealing a horribly burned and twisted face. Then he opened his mouth and hissed, exposing the twin fangs of a vampire. Landon was paralyzed as his foe lunged for his throat. I’ve been writing this new series for my nine-year-old grandson for almost three months now, and it keeps evolving as I read it to him and as he makes suggestions for future chapters. I finally hit upon who the mysterious evil is going to be, but I’m not ready to reveal that yet. See if you can pick them out of the body of my story. The next chapter is Impaler.